Is it showing just how often that I actually use my slow cooker? The food rarely looks pretty on the plate, unless it is a curry, risotto or a piece of meat for carving, but hotpot style food just never looks right although it tastes fantastic. Saturdays are manic here with football matches and club sessions, so making a proper meal on a Saturday is a rare occurrence. I had a pack of sausages in the fridge with a bag of potatoes in the cupboard and that makes for a perfect slow cooker meal. As usual, my slow cooking is just all thrown in. 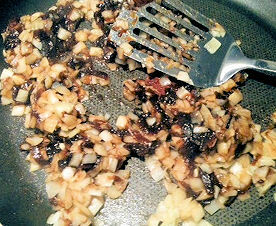 I wanted to give the sausages the taste and aroma of the onions so I took the frying pan out and first let the chopped onions cook for a few minutes on low heat. 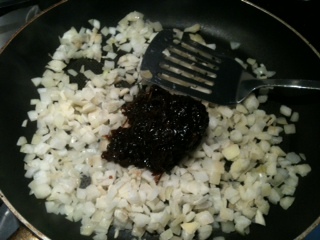 Turn up the heat a little and fry the onions until they are mixed in with the caramelised ones. 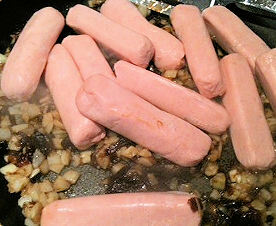 Add the sausages to the pot. 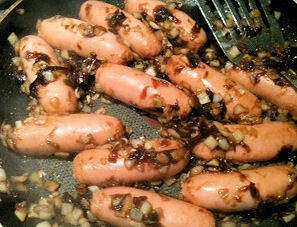 Lightly cook sausages in the pan with the onions. Then put the sausages and onions into the slow cooker, along with the vegetables and fill with enough boiling water to cover the ingredients. Add the stock pot or stock cubes and salt. 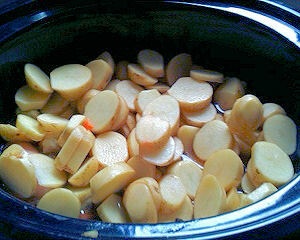 Place the sliced potatoes on the top of the ingredients in the slow cooker. Don’t put any more water in the pot. Put on the lid and cook for 8 hours on low setting, or 4 hours on high setting. Thicken before serving with cornflour and hey presto. I really, really wish I could get slow cooked pots of food to look prettier on the plate for photographing, but I don’t seem to be able to. My sausages crumbled when my mother in her eagerness to help, had decided to take off the lid when I was out, and give the mix a good old brisk stir. There was enough food in the pot to feed 6 of us. That was a meal on a budget and a half. Never thought about slow cooking sausages before. 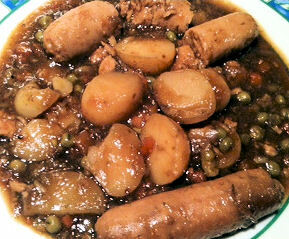 One thing that appeals about the dish is that it’s all there – no need to do spuds and veg separately so less washing up. Is fab to do the veg an tatties in with hotpots, roasts, all sorts so all cooked at the same time. I am a slow cookeraholic. I really need to write some more of the recipes up. Wow! 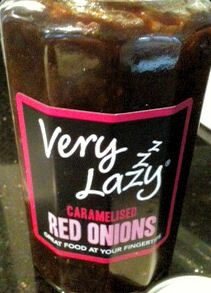 looks yummy, I want to try this , I love Onions. even while cooking the smells make me more hungry. @Scottish_Mum hey u, the husband LOVED it!!!! ate loads!!! It is delicious. Far too delicious actually lol.